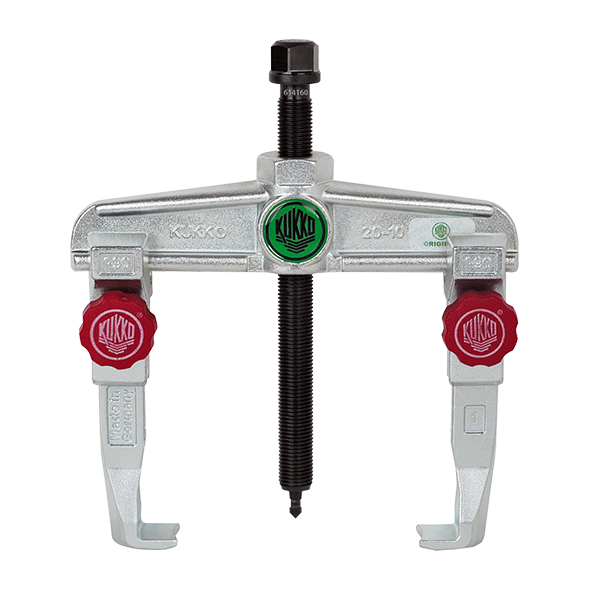 Kukko Universal 2-jaw puller with quick adjusting jaws for removing bearings, gears, discs, etc leg length 120mm maximum pulling diameter 100mm. Standard pulling hook with quick adjusting capability quick adjust. Pulling hooks with infinite adjustment on the cross-beam. Two-arm design for space-saving operation. Parallel pulling hooks in every position, even with full load. Strong design, high performance and long service life. The part due to be removed (e.g. a gear, pulley or ball bearing) is gripped from the outside. Tightening of the pressure screw and the resulting pressure removes the part from the shaft. The puller must be positioned centrally for centre shafts. If the shaft is not sitting centrally, the parts can be removed asymmetrically with pullers with parallel pulling hooks. The pulling hooks’ sliding parts must always sit stably and fully on the cross-beam. The pulling hooks’ support surfaces must always be straight and sit fully beneath the part to be removed.